Smartifik offers natural language processing and understanding applications. Our expertise lies in the field of conversational artificial intelligence. Our technology gives different applications the power to understand language and to perform customer service tasks automatically. Our job is to enable companies to give their customers instant service around the clock while lowering costs. Interested in our products? Contact us! 90% of the consumers who bought an item from an online store said they have used site search to find self service material. Users want their questions to be answered quickly. The more content a site has, the harder it is to find answers. Smartifik QA is a language and artificial intelligence equipped Question-Answer machine designed for web sites. Smartifik QA answers to user questions without queues for 24 hours a day every day of the week. Questions that can't be answered by Smartifik QA, will be stored to a database where the answer can be taught. Language technology enables Smartifik QA to recognize similar questions although they are asked differently. Smartifik QA works as a cloud based service and includes an automated Q&A database. Smartifik QA is installed by adding one line of code to your web site. Teach an answer once and Smartifik QA will answer the question always. Smartifik QA searches answers to users questions from a database. Smartifik's language technology can find similar questions even though the questions are written differently in the Q&A database. Finding information has never been easier. The user doesn't have to browse to find answers. User can ask a question to find the answer. Tecnology enables the user to be served fast and accurately. Users can use keywords to find relevant questions from the Smartifik QA database. Keywords are a fast way to find simple information. Technology generates keywords automatically from the database. This makes the search comprehensive and easy to use. If there is no answer for a question in the database, Smartifik QA will ask the user for an e-mail address. 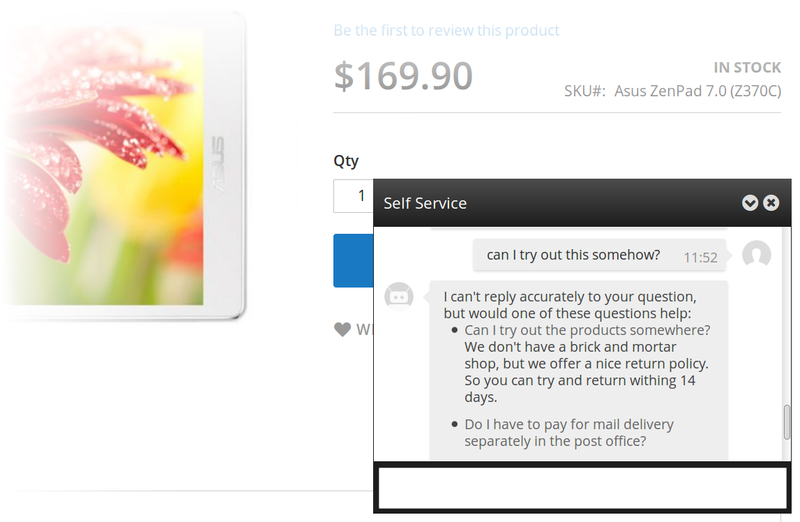 Smartifik QA then forwards the question and contact information to the company's customer service. The contacting function will collect new user information for a business. This way the user will be always served although there is no answer available in Smartifik QA. Smartifik QA includes a traditional Live Chat -feature. Customer service can browse live conversations that Smartifik QA is having and join in a conversation. Smartifik QA can be setup to call for customer service personnel when there is a need for one. Smartifik Dialog enables automatisation of customer service. Smartifik Dialog understands English conversations and performs tasks given in them. We offer Smartifik Dialog as a SaaS -service. Smartifik Dialog can be customized easily to match Your needs. Smartifik Dialog is an excellent tool for companies who wish to generate savings and offer their customers the most advanced self service in the market. Accurate full sentence searches to product, question and site databases. Users want service and solutions to their problems as fast as they can when they visit a web site. Smartifik Dialog engages into conversation with a user. During the conversation it's possible to solve problems quickly. Smartifik Dialog replies to user's questions, searches for information from different sources, redirects user to correct sections in the site and obtains valuable information from the customer. 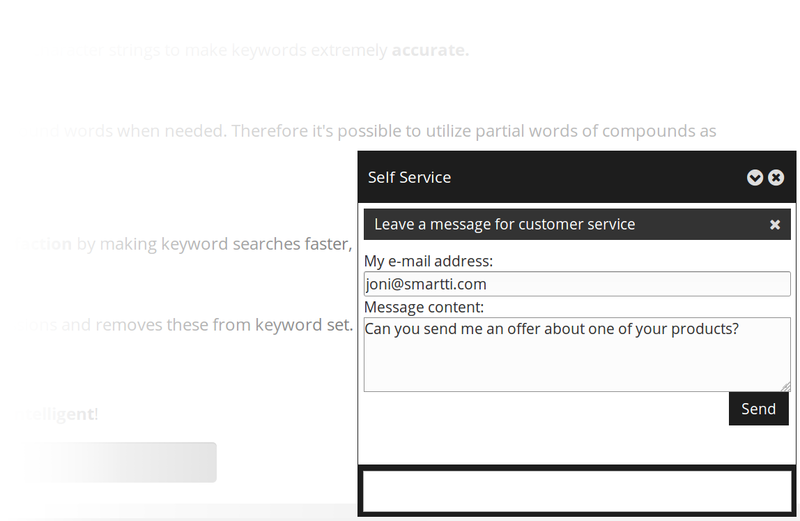 Smartifik Dialog can be used to automate different types customer service tasks. What should i consider when I am buying a sofa? - You should take into account the material. Leather lasts longer than textile if it is taken care of properly. In section (3) the user's input is recognized as a product search and sofa is picked as a keyword. In addition to the product search result (4) Smartifik Dialog has selected a suitable question from the question database as additional information to make the product selection process easier. (5) User: Where can I find warranty information? (6) Dialog: All products have a 36 month warranty. As the user asks for warranty information (5) Smartifik Dialog returns a general answer concerning warranty (6). (8) Dialog: You are welcome. (9) Dialog: Do you need anything else? (10) User: yes. I can't remember my password. (11) Dialog: I will quide you to the correct web page. User activates a password recovery function by telling that password is forgotten (10). Smartifik Dialog redirects user directly to the password recovery site (11). When user asks a question to which there is no accurate answer (12), Smartifik Dialog suggests similar questions (13). (12) User: Can I change my address information from somewhere? Where can I change my street addess? - You can change your address by logging in and clicking on the settings tab. There you can modify personal information such as address and phone number. (14) User: Thank you and good bye! (15) Dialog: Thank you and welcome again! Smartifik Dialog is easily programmed to perform both simple and complex customer service tasks. It's easy to save money by automating customer service tasks. Cost-efficient and always open customer service application works as a support for customer service personnel and improves customer experience in a web site. Smartifik Dialog will make your web site intelligent. In customer service a lot of time is consumed by incomplete customer service requests. Smartifik Dialog analyzes user's input and asks for further details if the input doesn't contain all the information that is needed by the customer service personnel. Lenovo Business X235 Warranty 3 years on site. Call Lenovo customer service 0800 124 124. Lenovo Yoga 2 Warranty 2 years. Bring the product and receipt to our shop. All Models Bring the product to our shop and we will fix it. We will charge 69€ from an insurance company repair evaluation. (1) User: My Lenovo laptop is broken. (2) Dialog: I'm sorry to hear that. What Lenovo product is it? (4) Dialog : Do you want warranty service? (6) Dialog : Warranty 3 years on site. Call Lenovo customer service 0800 124 124. In the example the user announces that laptop is broken (1). Smartifik Dialog recognizes the sentence as service request and checks what service information does the database provide for Lenovo laptops. There are several Lenono products with different service information so Smartifik Dialog asks for more information about the product (2). Smartifik Dialog extracts the necessary information from the customer response (3) and asks an additional question (4). Now Dialog has all the required information to give the answer from the database (6). Additional questions enable automatic conversation between user and Smartifik Dialog customer service application. They can be used to give more accurate information for the users. Additional questions also save time by getting all the required information ready for the customer service personnel, before they start to work on the user request. Automating simple customer service task in a way that feels natural to the customer has never been this simple. Smartifik Dialog analyzes the customer input and extracts meaninful elements to be stored into a database. (2) Dialog: You need to log in before I can modify your billing address. (3) Dialog: Please enter your new billing address. (5) Dialog: What is your road number? (9) Dialog: Thanks! I'm glad to help! (10) Dialog: Hey, I noticed that our database doesn't have your phone number. You should save it, so that we can inform for example about black outs automatically. In the example the user wants to modify a billing address (1). If the user hasn't signed in to the service Smartifik Dialog asks the user to log in. When the user has logged in Smartifik Dialog asks for the new address (3). In addition Smartifik Dialog can ask for details such as phone or e-mail missing from the database (10). Smartifik Dialog then stores the information into company database. Storing new or modifying old data is natural using Smartifik Dialog, because the customer is served by a software cabable of understanding English. With our intelligent technology, it's possible to let customer search using full sentences. Smartifik Dialog evaluates and extracts the most meaningful words of the sentence to create extremely accurate database searches. Q1 Are Artek's chairs high quality? A1 Artek's furniture are hand made in Finland so they are extremely high quality. Q2 Are Artek's tables high quality? A2 Artek's tables are hand made to ensure their high quality. Q3 Are Art's leather chairs high quality? A3 All our leather products pass tight testing phase, which indicates the high quality of the products. (1) User: Where can i find Art's leather chair? Are Art's leather chairs high quality? - All our leather products pass tight testing phase, which indicates the high quality of the products. In the example Smartifik Dialog recognizes the question as product search (1) and returns Leather Chair (2) as an answer. Smartifik Dialog analyzes the sentence and extracts the main word "chair". Dialog finds two matching questions from the database using the word "chair". The questions are refined with the additional words "Art" or "leather" to find the most relevant additional information to be presented to the user. This function advances sales by giving valuable additional information about the products to the user. (1) User: What would be a high quality chair? Are Artek's chairs high quality? - Artek's furniture are hand made in Finland so they are extremely high quality. In the second example Smartifik Dialog recognizes the user's question as product search (1). The words high and quality are not used as keywords, because their significance as a keyword is weak for product search. These keywords are used for example to rearrange products according to quality factor in the product search results (2) with “high quality first”- principle. On the other hand in the question database, the words high and quality have more significance, so it's good to use them as keywords. This allows Smartifik Dialog to show additional product quality information from the question database(3). Notice: In many competing search technologies product search with keywords "high", "quality" and "chair" would not find Leather Chair and Artek Chair as a result. The reason is that these products don't contain the keywords "high" and "quality". Smartifik Dialog makes it possible to change the significance of certain keywords to different databases to improve the accuracy of search results. Smartifik Dialog understands sentences. This enables the search function to adapt to product, question and site databases in different ways so that the queries made for each would be as accurate as possible. In addition the search result combination of different databases increases sales by giving valuable additional information about the products the user has searched. Smartifik specializes in language technology. Word inflections and compound words are a problem for most common search solutions. Smartifik Keyword tackles these problems with sophisticated natural language processing. Make your search fast and accurate! Words are often in inflected form in texts. As user does a keyword search with words in basic form all correct results are not shown. Smartifik Keyword inflects the words in texts to basic form, so that they can be discovered with the user's keywords. Scarface Mittens Black designer mittens. With big Scarface logo. Scarface Woolly Hat Black designer woolly hat. With small Scarface logo. Stardust Scarves These scarves are an exellent product for winter. Warmy Scarf Red nice scarf. Be cool when it's cool. User searches with the keyword Scarf (1). Regular product search return only one result Warmy Scarf (2). Smartifik Keyword transforms the keywords to basic form, which makes it possible to find Stardust Scarves (4) as well. Part of the search solutions available in the market solve the missing product problem (2) in the example by taking "close matches" into account when showing the results. This will add a lot of wrong products into the results especially if the keyword is short. For example the keyword scarf will give all Scarface products also as a result (6). The more keywords in a query the more unrealiable such search solutions work. These search solutions might work for simple inflection issues such as "mitten" and "mittens", but struggle in harder cases. Smartifik Keyword on the other hand inflects English words correctly and gives proper results. Smartifik Keyword uses actual words instead of character strings to make keywords extremely accurate. Smartifik Keyword recognizes and slices compound words when needed. Therefore it's possible to utilize partial words of compounds as keywords to gain maximal results. Shovel for snow Durable shovel for winter. 5 year warranty. Snow-shovel extreme Extremely large shovel for large front yards. WinterWonder snowshovel WinterWonder shovels are extremely durable products. User searches with keyword shovel (1) and receives 103 different shovels as a result (2). He tries to go through the results but there are too many. The user makes another search with the keyword snowshovel (3). Regular product search can find only WinterWonder snowshovel - product (4) as it the only product with exact keyword. Smartifik Keyword splits the compound words in both user's search and product description so that the user can find all three matching products (6). Smartifik Keyword improves customer satisfaction by making keyword searches faster, easier and more comprehensive. Smartifik Keyword recognizes negative expressions and removes these from keyword set. Audi shock absorber, Original Original shock absorber. All audis except A4. Audi shock absorber, Bulk Inexpensive Bulk shock absorber. Audi A4. Audi shock absorber, Bulk2 Bulk shock absorber for rough usage. All audis, but not A4. User searches with keywords shock absorber audi A4 (1). Regular product search return all three products as a result (2). Smartifik Keyword removes extra negative keywords. Hence user receives only the correct product Audi iskunvaimennin, Bulk (4) as a result. Smartifik's technology will make your search intelligent! Smartifik Speech will take your speech recognition system to the next level. Smartifik Speech utilizes Smartifik's language technology. All the previously mentioned products can be added to part of a speech recognition system. Smartifik Speech will increase the intelligence of a speech recognition system as it enables the undestanding of complete sentences. Watch an example of how Smartifik Speech improves a traditional speech recognition system. Scroll down to see the demo. Traditional keyword based systems can be used only by short speech commands. I would like to order a Opera Special from the nearest restaurant. Make your speech controlled system intelligent – get Smartti now!